Professor McDermott has pioneered new ways in which design is curated and communicated through her work in establishing the postgraduate programme MA Curating Contemporary Design at Kingston University in partnership with the Design Museum in London. 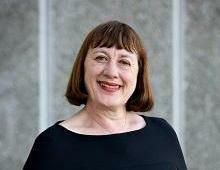 She has been honoured for her work in academia, received the National Teaching Fellowship Award, is author of many books on contemporary design and serveD on numerous national and international advisory boards, currently the Secretary of ICOM UK (International Committee of Museums). For her innovative teaching and particularly for her pioneering work in establishing the postgraduate programme MA Curating Contemporary Design at Kingston University in partnership with the Design Museum in London.